Yeah, but: I'm getting old, and possibly grumpy. The Long Version: I'm a photographer who loves signs, but it took me a very long time to pick up this book when I was last shopping at Swipe. I've been burned before, discovering over and over again that photo books with blindingly obvious and mundane titles contain noting more than blindingly obvious and mundane photos, and road signs are a popular topic for artless and automatic photography. 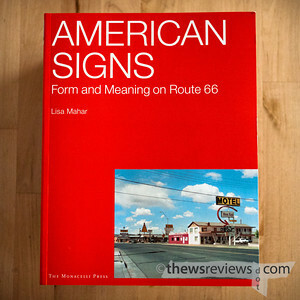 When I did finally grit my teeth and pick it up, Lisa Mahar's book "American Signs: Form and Meaning on Route 66" blew me away. The blurb on the back cover of a book can be very revealing, so that's a good place to start. 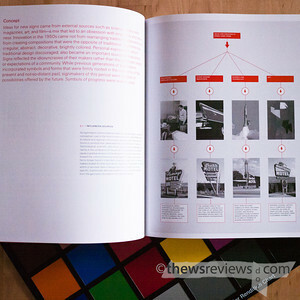 I completely agree that "with its insightful writing, clear graphic diagrams, and hundreds of contemporary and historic [sic] images, American Signs is a singular reading experience and a groundbreaking study." It completely devotes itself to the study of motel signs, which reflect a distinct set of challenges as the business try to differentiate themselves from the competition and attract customers that they have never seen before and will likely never see again. Awesome. The book looks at trends across about fifty years, breaking each era into its own chapter. All follow the same structure, making it easy to see and contrast the changes over time. It becomes a fascinating sociological study, showing changing attitudes through the names of colours and businesses, and tracking travel patterns through the height of the signs and the arrangement of their elements. The shift from vernacular craftsmanship to professional industrial design, the rise of branding, and changes in fabrication techniques are all within its scope. There are a couple of points that I can quibble with, such as naming a particular typeface that isn't depicted in the accompanying image, but the book serves its purpose as a general guide rather than a specific survey. Possibly the best praise that I can give a book is that its insights have made a lasting difference in how I see and interpret the world. American Signs has certainly done that, and now when I look at the sign for a business I pay attention to the emphasis of "name" and "function". It's how each business subtly communicates how it sees itself and its role within the local community. My appreciation of that is directly because of reading American Signs, and I'm sure that Penny also thanks Lisa Mahar for giving me one more reason to be distracted when we're out together. Back to the back cover. Signs "are complex pieces of design" and American Signs analyzes "their concept and influences, typestyle and color choice, form and composition, context and placement." So with such emphasis on "typestyle and color choice" in the content of the book, I have to say that the typesetting and colour choices in American Signs are a huge disappointment. The majority of the book is set in what appears to be six-point type – an uppercase letter "T" is a mighty two millimeters high – as if Lisa Mahar was writing nothing more important than a series of captions. Most of the text is black on white pages, but occasionally it's reversed to an even lower contrast white on a red-orange page that echoes the cover. When the text is larger it's in that same accent colour on white, which turns out to be not much more legible despite its increased stature. The typesetting for the introduction deserves special mention. 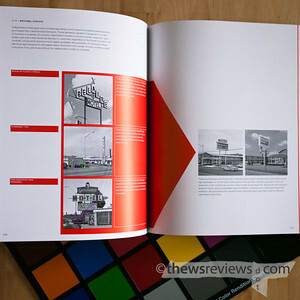 Text elsewhere in the book is restricted to a single page, but the introduction spans better than ten pages and four double-truck photographs. That means that there's a double page of text alternating with each double-page photo, and any photo printed that large is clearly meant to be looked at. The elegant thing to do would be to end a paragraph before each photo spread, or at least finish the sentence. That way the reader can complete their thought, admire the art, and then rejoin the narrative with minimal mental disruption. Not only does that never happen, but twice the page break leaves the reader hanging on a hyphenated word. In ragged-right text. Seriously, who does that? Yes, my last birthday put me on the wrong side of 37, and my eyesight has never been the best. But reading the minuscule little text in anything but brilliant lighting is impossible at any comfortable distance. The vast deserts of white space that could otherwise be put to productive use just makes the designers' adherence to its layout grid all the more senseless. Typography is supposed to invisibly enhance the content of the book, not substantially diminish it. 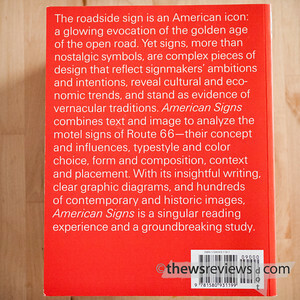 That the format of a book specifically about communication and information design would fall down so badly is a real pity, because American Signs is "a groundbreaking study" that deserves to be read and appreciated properly. So maybe we should get together and do something better? And that crack about being on the wrong side of 37... I'd love to be back on the wrong side of 37, instead of 57. Bill, look on the bright side: you're still on the wrong side of 37.